Special Mat Classes for Dancers, with Jon Owen! August 14 and 21 at 2:00 p.m. DANCERS! This month, Pilates Challenge is offering two special Mat Classes for Dancers, taught by Pilates Instructor and dancer extraordinaire, JON OWEN! Wednesdays, August 14 and August 21, from 2: 00 p.m. to 3:00 p.m. Only $15 per class for a great workout, specifically for dancers. Come join us for some fun in our beautiful, energizing studio. Call or email now to reserve a place. And bring a friend. Bring two! Also, Kathi will be teaching private sessions at the studio from 10:00 a.m. to 4:00 p.m. Observers are welcome (no fee). Everyone is invited to stop by to watch the action. So, come early and then stay for the workshop! Expanded Mat Class Offerings Continue this Week! Monday, June 24, 6:00 p.m.
Wednesday, June 26, 10:00 a.m.
Thursday, June 27, 10:00 a.m. and 7:00 p.m.
Friday, June 28, 10:00 a.m.
Join us for a great core-strengthening 45-minute workout! Classes may be purchased individually ($25 per class), in packages of five or ten, or with a 30-day unlimited pass ($250). Call or email for details. Additional Mat Classes and New Unlimited Mat-Class Pass Available! We are welcoming this blast of summer with additional mat classes and a new 30-day unlimited mat package. (And unlimited A/C, too!) Come join us, mornings or evenings — or both!– for a great workout! This week, we have added a mat class Monday, June 10, at 6:00 p.m. Of course we still will have our regular Tuesday/Thursday 7:00 p.m. evening classes and our morning sessions Wednesday, Thursday, Friday, and Saturday at 10:00 a.m.. Stay tuned for more in the weeks ahead! Monday, June 10, 6:00 p.m.
Tuesday, June 11, 7:00 p.m.
Wednesday, June 12, 10:00 a.m.
Thursday, June 13, 10:00 a.m. and 7:00 p.m.
Friday, June 14, 10:00 a.m.
Saturday, June 15, 10:00 a.m.
To make working out even easier, we are offering a special 30-day unlimited mat special. For $250, come to as many mat classes in 30 days as you wish. Our usual per-session and package pricing remains available ($25 for a single session, five for $115, and ten for $200). Each mat class provides a great 45-minute workout, suitable for all levels. Call or email to reserve space. 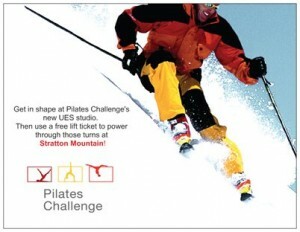 Final Weeks to Take Advantage of Pilates Challenge and Stratton Mountain’s Joint Offer for Spring Skiing in Peak Form! It was STILL snowing this morning at Stratton Mountain, and Pilates Challenge can get you on those snowy slopes! Stratton and Pilates Challenge are partnering to help you get in condition and to power through those turns! Pilates is an amazingly effect workout for skiers, and when you purchase Pilates Challenge’s package of ten mat sessions or five private sessions, you will receive a complimentary full-mountain all-day lift pass valid at Stratton Mountain for any day this season. With a package of ten private sessions, you will receive TWO lift tickets. Conditions on the mountain are superb and, with Pilates, your condition will be superb, too! Call or email to arrange for a package, plan a few amazing workout sessions, and take advantage of some fabulous spring skiing at Stratton Mountain! MORE MAT CLASSES: WEEKDAY MORNING SESSIONS! Our mat classes have been so well received that we are experimenting with additional sessions. As a pilot effort, this week on Wednesday, Thursday, and Friday (April 10, 11, and 12, 2013), we are offering MORNING mat classes at 10:00 a.m. each day. Come join us for a fantastic 45- minute workout! Classes are $25 when purchased individually, but packages are available at $115 for five classes, and $200 for ten. Call or email to reserve space now. Join Kathi Ross-Nash, donna•m, and Pilates Challenge on March 8th for an event inspired by movement! Call or email for details. We are accepting reservations for Kathi's mat classes, as space is limited, but please feel free to visit the trunk show any time from 4:00 p.m. to 8:00 p.m. Come join us! Power and Powder! 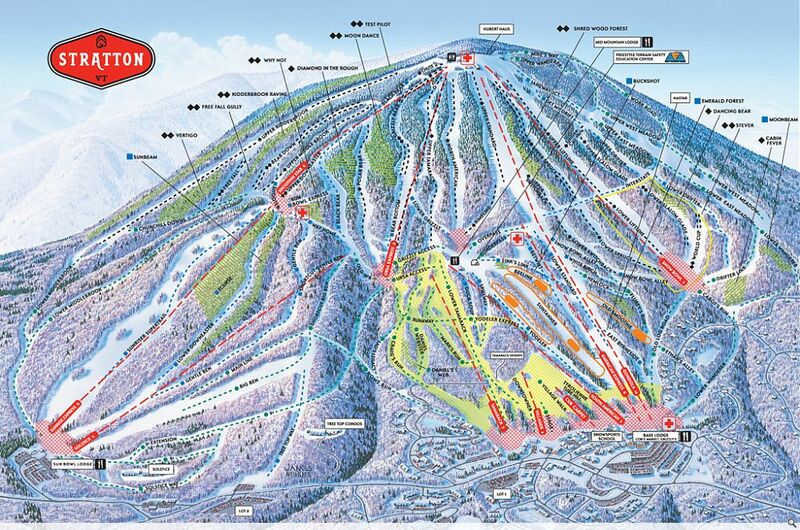 Pilates Challenge and Stratton Mountain Can Get You in Shape AND on the Slopes! 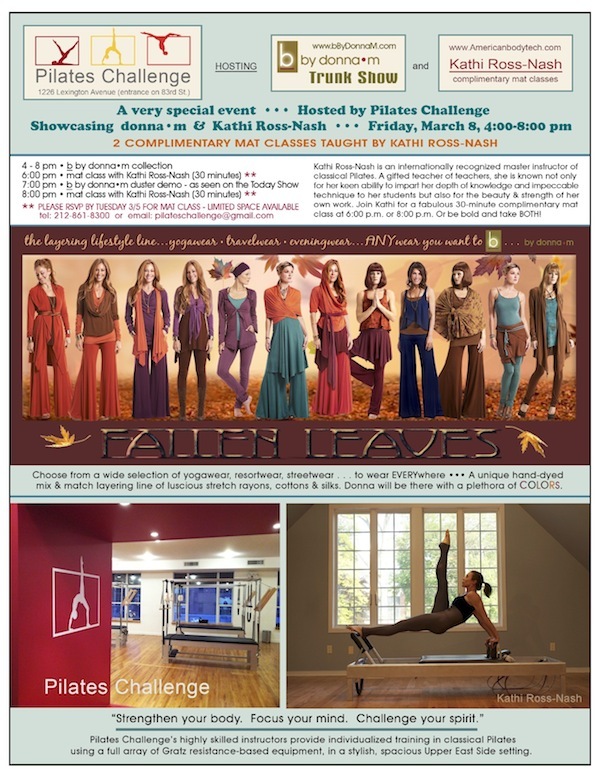 Pilates Challenge and Stratton Mountain are offering a special, limited-time power and powder opportunity! 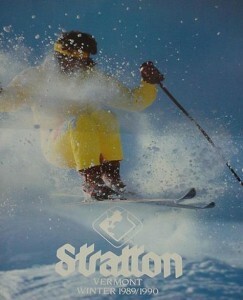 It has been snowing at Stratton and conditions are great! You want to be in top form for those turns, and a series of sessions at Pilates Challenge will strengthen your core, improve your balance, and enhance your flexiblity as you carve those turns. Purchase a package of 10 private one-to-one sessions and receive a complimentary full-mountain, full-day lift ticket valid any day this season at beautiful Stratton Mountain. Purchase a package of 20 private one-to-one session and receive TWO complimentary full-mountain, full-day lift tickets valid for any day this season at Stratton Mountain. Prefer to workout with a friend? Contact us to talk about duet packages and corresponding lift-ticket options. Availability is limited, so call or email now to take advantage of this great opportunity to see how effective classical Pilates — taught by Pilates Challenge’s skilled instructors using top-notch Gratz resistance-based equiment — is in preparing you to tackle Stratton’s snowy slopes! Stratton Mountain and Pilates Challenge are partnering to help you improve those turns. Free lift pass with private-class package! Let Pilates Challenge help you get back on the slopes and in shape pronto. And by special arrangement with Stratton Mountain in Vermont, we will give you free all-mountain lift tickets to boot (pun intended!). Pilates is the ideal fitness program to build the strength, balance, stability, and flexibility that skiers need. Work out with the Pilates method and you WILL see improvement in those turns! Purchase a package of 10 private one-to-one sessions at Pilates Challenge and receive one full-day, all-mountain lift ticket for Stratton Mountain, valid for any day this season. Purchase a package of 20 private one-to-one sessions and receive TWO full-day, all-mountain lift tickets for Stratton Mountain, valid for any day this season. After 10 sessions or 20 sessions you will feel the difference in your performance. Try our ski package and see for yourself! Call or stop in now, as supplies are limited. Explode your season with Pilates Challenge and Stratton Mountain! Only a limited number of ski packages are available; ski packages are sold on a first-come basis.